If you are here, you are hopefully a writer thinking about publishing fanfic here on MTT. Here is a visual guide showing you how to do just that. You need to be registered on this archive. Click here to register. Our text editing system (tinyMCE) is recommended for light editing only, and drafts can't be saved, so please have your story saved elsewhere so you don't lose your work! 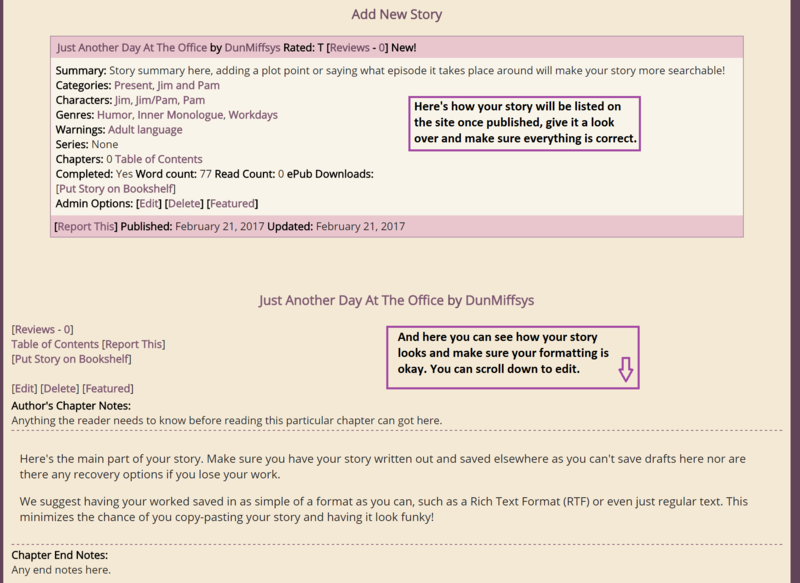 Though you can submit stories on mobile/tablet, it's best done on a laptop/desktop computer. Make sure you have read the Submission Rules. It looks like a wall of text but it's pretty straight forward. Though you can copy/paste from Word/Pages/Google docs/etc, programs like these add a lot of formatting to text that often doesn't play well with the text editor or the site. We suggest writing in a program with as little formatting as possible. Some program suggestions: iA Writer, Byword (paid apps), Dillinger, Yarny (free webapps). So, first thing's first, log in, head to My Account and then select Add New Story. Now you're faced with the submission form. Titles and summaries should be work-friendly, and titles like "Please read" or "Untitled" are also not permitted. You are required to include something in the summary form. For searching purposes, we recommend including your stories premise and/or the episode/time the story takes place. While there isn't a character/word limit for summaries, they should be concise (we suggest less than 100 words). Story notes will be visible on the Table of Contents and at the top of the 1st chapter. They can include anything you feel the read should know before starting your story, and are also a good place to put your disclaimer (you only need to add a disclaimer once to a story). 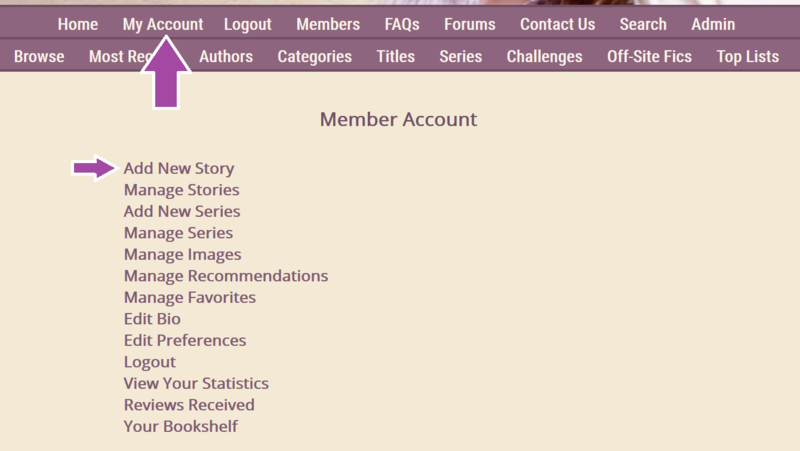 After the title and summary/story notes comes all the classifications like genre, characters, and category. 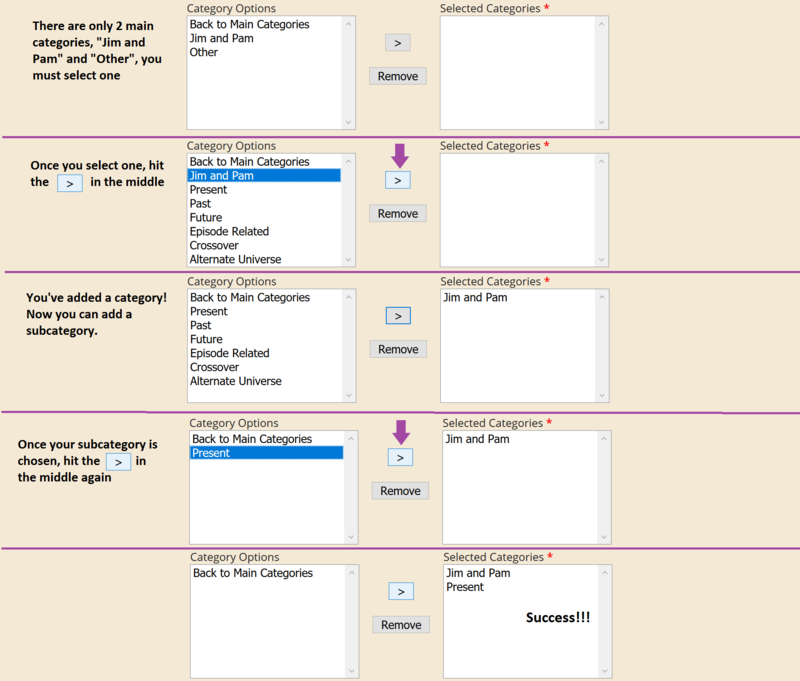 Selecting a category is probably the trickiest part so here's a step by step guide. Start off by clicking either "Jim and Pam" or "Other" then click [ > ] in the middle to select it. It should now show up in the right hand box. After that choose one of the following subcategories. Future: Takes place somewhere down the road. Episode-related: The story shows us missing scenes of an episode or deals with the internal monologues some characters may have had during certain scenes. Crossover: Characters from another TV show/movie/book interact with the Dunder-Mifflinites. Alternate Universe: The story takes place in another time and/or setting, or the story's premises differ dramatically from the show. After highlighting one subcategory, hit [ > ] again. Select every character with a central role in your story. If you have many Office characters saying only a couple lines each, you can select "Ensemble". In the characters box you will see several pairings like Jim/Pam, Dwight/Angela etc. Only select these pairings if the relationship is a central part of the story. Also select the genres your story fall into. Press Ctrl (Cmd on Mac) as you click to select non-adjacent characters/genres. Now for ratings and warnings! Select any of the warnings that apply to your story and give it an overall rating. If you need any clarification on any of the warnings we have a page with explanations . Mature content is permitted, however there are a few activities we don't allow stories to contain, please review the submission rules . 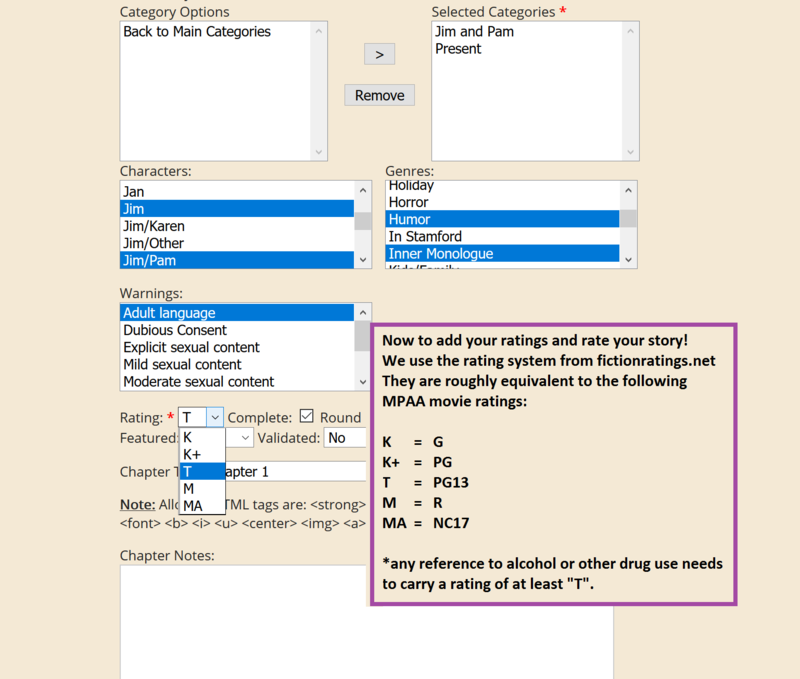 We use the ratings system from fictionratings.com. Here are what they stand for (with their MPAA rating equivalent). Now the fun part, the Story text. Again, it's best to have your story written out, formatted the way you want and saved to your own device/cloud account then copy-pasting it into the Story Text box. Chapter Notes should include anything you feel the reader should know about that particular chapter before reading. End Notes are a good place to put credits or links if you referred to something in particular in the chapter, and also a good place to kind of communicate with your readers. 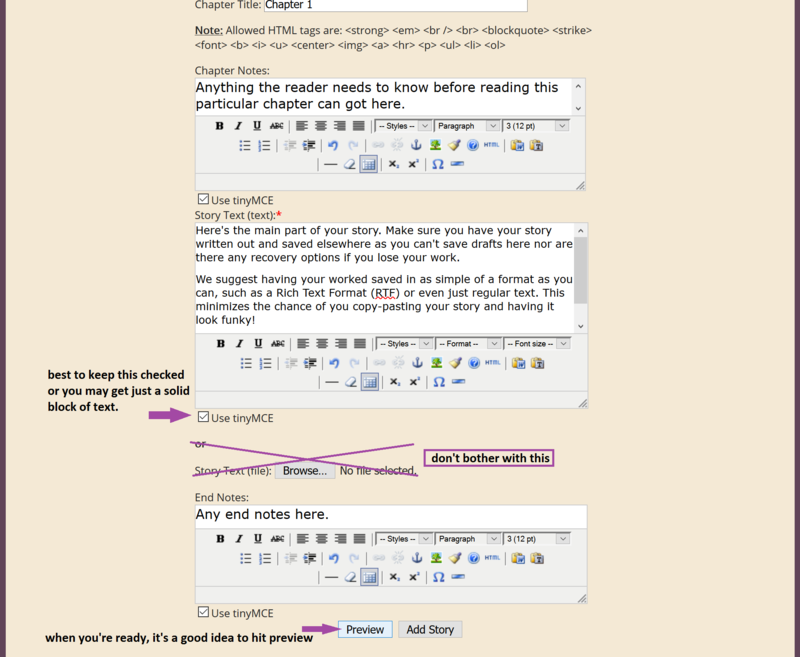 But in general, less is more with Chapter/End notes. Your story will be easier to read if you have a line break between paragraphs. Avoid indentation, it makes it more difficult to edit (especially on mobile). Don't fuss with the "Styles", "Format" or "Font Size" in the tinyMCE edit box. the tinyMCE editor will underline misspelled words, but doesn't do spell check, again, best to have your story finished and polished up in a separate text edit program. When you have your text all set, hit preview at the bottom. 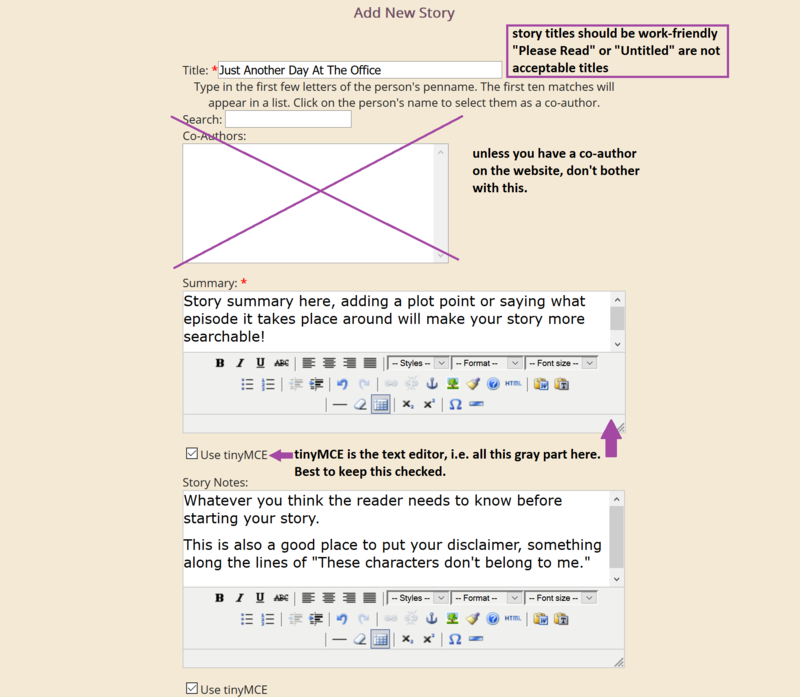 This will show you how your story will look once submitted and published. Scroll down to find the text edit box where you can make any final changes. And then you're ready to hit submit! 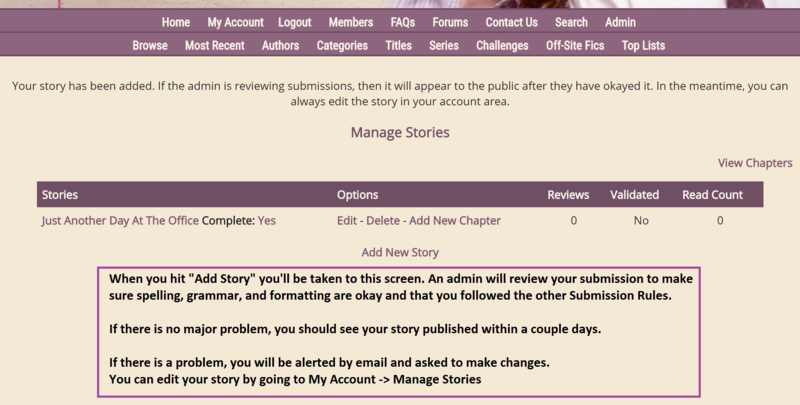 Once submitted, you will be taken to Manage Stories. 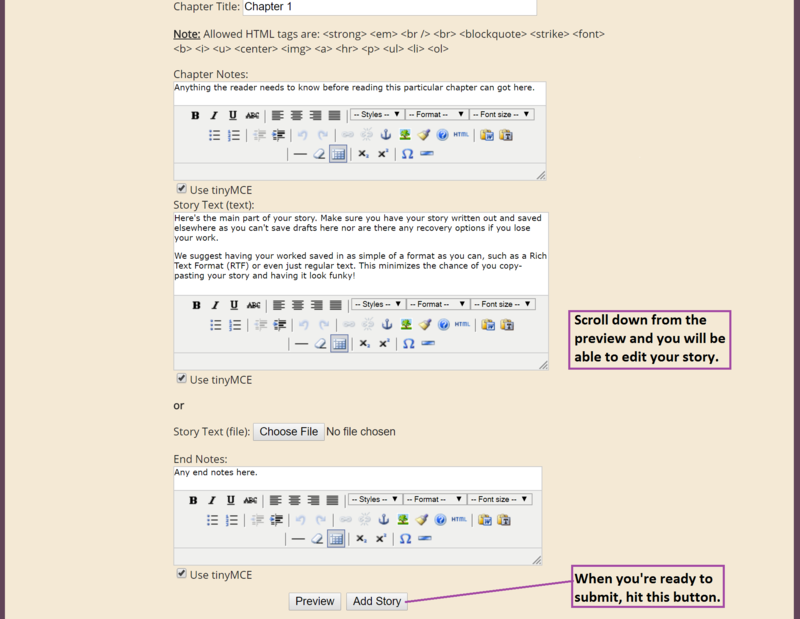 Even if your story is not validated yet, you can return here any time to make any changes or add chapters. Every author's first submission is held for validation and the admins will look it over. We are mostly checking to make sure the formatting is readable, that spelling/grammar errors are few and far between, and that you followed the submission rules. We generally are able to validate within a day, but we do ask you give us 3 days to complete this process before inquiring about your submission. We'll try to notify you by email when your submission is approved and published, but the quickest way to check is to see if your story is in the most recent section. If there are many or severe issues with your submission, we will contact you by email and request you make changes. Authors who consistently display good formatting, spelling/grammar and adherence to the Submission Rules will earn validation meaning their submissions will be published immediately instead of waiting for admin validation.